The key to establishing a successful and profitable embroidery business is targeting the market that best suits your skills, capabilities and interests. To do this, you need to understand yourself, your business and the market your trying to sell to. A lot of our customers have started by going after the business they are best-connected in: their children's school, equestrian fans or even simply local businesses around their areas. Just think about all the ways in which companies use these goods. There's the annual sales meeting where attendees are often given a shirt or cap embroidered with the company logo. For a company golf outing, embroidered golf towels might be presented to each golfer. Many companies either require or encourage their employees to wear apparel embroidered with the company's logo. Most of these products will be purchased through advertising specialty representatives, who sell an array of promotional products. These include such items as pens, mugs, shirts, towels, caps, key chains and totes. All are usually personalized with the company's name, logo or some sort of slogan. These people are basically brokers for different manufacturers and rely on many different sources for their goods. Since the majority of representatives don't have in-house embroidery capabilities, they normally place their embroidery business with a local embroiderer. Therefore, your first step is to let these people know who you are. Of course, to do that, you need to know who they are. Look in the Yellow Pages under Advertising Specialties. Then start cultivating relationships. Begin with a letter or phone call. Consider sending a sample of work that's been personalized for the individual. Stay in contact and continue to let these folks know that you are interested in doing business with them. Small towns and municipalities can be a great source of potential business. The staffs in the town hall, police department, inspectors, recreation department and other areas all wear or would like to wear clothing embroidered with their city or departmental logo. And, there's always the need for shirts and caps for special events or a one-of-a-kind jacket for a visiting dignitary or local hero or even leisure wear for off-duty hours. How do you get into this market? It's all about connections. If you've been a city employee or a volunteer fire fighter, you've already got a strong foothold. You probably already know the right people. If not, think about your circle of friends, relatives and acquaintances. Someone close to you may know the person who makes the purchasing decisions. Ask for an introduction. People like doing business with people they know. Start building your network and showing what your business has to offer. Armed with an embroidered city logo, which was digitized at his expense, one embroiderer went to city hall and asked to speak to the city manager. Until then, the city had screenprinted the logo. After being shown the difference in quality, the city manager switched to embroidery. Along with taking advantage of personal connections, watch out for upcoming special and educational events relating to police and fire-related occupations. With a little research on the Internet you can uncover a wealth of sales opportunities. It might be worthwhile to exhibit at some of these events. Do your homework first to make sure it would in fact be profitable. When deciding to work with governmental agencies, be sure to consider that there may be certain restrictions and guidelines to follow. Most agencies have very specific protocol they want vendors to follow. Sometimes there's a bid process. But, don't let this scare you. In some cases, you may only have to win a single bid to become the embroiderer of choice for a particular organization. Consider creating your own line of embroidered fashion items to mix and match. A simple black knit dress is quickly transformed into a unique fashion statement with the addition of embroidery. Go a step further and embroider a shawl and handbag with matching designs. 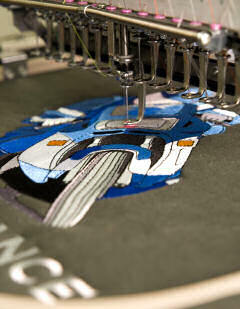 Develop a limited number of designs, which can be embroidered on a variety of items in various colors. Check out the suppliers to see what's available in the way of clothing. There are dozens of companies offering complete lines of inexpensive knit goods. These suddenly become more valuable when embellished with beautiful embroidery. Let your imagination run wild. Think bright colors, metallic threads, splashy designs. People are always looking for something different. You also need to determine how you will sell your creations. There are several options. You could work with existing retailers to carry your line. Or, you could open your own location, create a catalog or sell over the Internet. Do your research and determine what will best suit your particular needs. The explosion of business casual wear has left its impact on today's embroidery market. Gone are the suits and ties. They have been replaced with the more relaxed look of golf shirts, sweaters and casual button-downs. Most of these items are embroidered and if they are not, they can be. While Corporate America has seen fit to open its doors to more casual attire, it has also been smart enough to embrace this trend to its promotional advantage. A majority of companies provide their employees with shirts embroidered with the company logo. Some even require these be worn as a sort of uniform. Many companies will also offer embroidered merchandise to its employees through either a sales or incentive program. To tap into this market, check out the various companies in your area. Find out which ones are headquartered locally. Those will probably be the easiest to deal with. Get the name of the person in charge of purchasing Embroidered shirts and promotional products. This could be someone in sales or marketing. It could be an administrative assistant or even the owner of the company. Do your research up front to make sure you're directing your efforts to the right person. Once you have determined exactly who that is, make the contact and set up an appointment to show what you have to offer. Tailor your presentation to the corporate world. Include samples of corporate logos on caps and shirts. If you have time and it is a fairly simple logo, consider digitizing and embroidering their logo on a shirt or cap. Then, give it to your contact. After your initial meeting, stay in touch. While there may not be a job that day or even the next week, when something does come up, you want to make sure your name is at the top of the list of favored embroiderers. Other local embroidery companies (yes, the competition) are often an untapped source of business. In many cases, someone you consider to be competition could turn out to be your best customer. Most companies, no matter what their current size, started with a single-head embroidery machine that could produce only one garment or cap at a time. As these companies grow and invest in larger equipment, they often find it more profitable to contract out smaller, custom orders. Many find that a start-up, single-head operation is an ideal partner. These established embroiderers can be found in your local Yellow Pages under "Embroidery." Call them; introduce yourself and then follow-up with a letter or a visit. From preschool through college, the opportunities are almost limitless. Teams, clubs, fund-raisers, uniforms--the list goes on. Starting in preschool, students learn to keep track of their belongings. Personalized backpacks, mats and towels are common. The elementary and high school years are loaded with the opportunity to play various sports and belong to all sorts of clubs. Teams require uniforms and clubs love the recognition of embroidered apparel. And, when it comes to the desire to be a recognized member, nothing beats that of the fraternal organizations flourishing on today's college campuses. To take advantage of any of the previously mentioned opportunities, you first need to find the person in charge of purchasing uniforms and club attire. Contact the school office. Get the names of the coaches and club advisors. Think about whom you already know. Are there people who have connections that you haven't considered? A friend whose daughter is president of the Student Government Association? A neighbor who teaches at the local high school? Or a coworker whose husband coaches the school track team? Once you've come up with the right people, give them a call. Find out what they need and how you can help meet that need. Another idea involves fund-raising. Schools are always looking for ways to raise money and are open to ideas to make the task easier. Put together a fund-raising program featuring items embroidered with the school's logo. Come up with an assortment of merchandise that would appeal to both parents and students. Sweatshirts, nylon jackets, backpacks and sports bags look great with the school name and mascot. Make it easy. If you do the forms and organizational work for the fund-raiser, you increase your chances of repeat business. Build in enough profit margin so that both you and the school or organization make money. Use your success at one school to advertise embroidery possibilities at the next location. What you will need to sew (shirts, jackets, caps, etc.). How many items to make per day. The type of designs you will use (lettering, digitizing, ect.). You will need to learn about the competition and decide how you can be different. You'll need to find your niche and locate potential customers. You can do this by checking the yellow pages, Chamber of Commerce, finding resources at the library or on the internet. Do you like sports? Enjoy boating? Are you a dog lover? Maybe you spend your free time combing the beaches for unusual shells. Whatever your hobby, the point is to think about what potential markets might be developed based on your specific interests. Be realistic about your available funds. Some markets will require a higher initial investment than others. Determine what your operating budget is and stick with it, especially in the beginning. Search out markets that suit your present financial situation. Start with the Yellow Pages. How many embroiderers are in your area? What are their specialties? Compile a comparison chart of prices and services. Is there a particular niche that is not being covered? Make a list of the different groups and organizations in your area. You will find that almost every organization uses embroidery or would like to. You've zeroed in on your market, it's time to make a plan.